Giovanni Paolo Maggini (1580 – 1630/1) was born in Botticino Sera, near Brescia. After his father died in 1595 he moved to Brescia to work with Gasparo da Salò. He began to work independently some time after 1606, when his mother died. The Brescian method of making is very different from the structured approach developed by Andrea Amati in Cremona. Viols were being commissioned from Brescia in the late 15th century, and the development of stringed instrument making in that city grew out of this tradition. Gasparo is known mainly for his tenor violas, but the output of Maggini reflects the increasing demand for violins. He had two models of violin, the large pattern of about 37 cm and occasionally a smaller form of 35.5 cm. His violas, which for many players today are considered to be the ultimate instrument, were highly innovative. He was clearly driven by practicality and ease of playing rather than aesthetics, as seen by the positioning of his sound holes, half way along the body. The overall body length was reduced from Gasparo’s model of over 44 cm to a contralto size of 42.8 cm and 41.5 cm. It is thought that his small violas predate the Brothers Amati instrument of 1615. There are also two existing cellos which suggest that Maggini may have been the first to make a smaller cello, half a century before the Cremonese. Maggini’s life was cut short by the plague that swept through Brescia in 1630 to 1631 which effectively ended violin making in that city until G. B. Rogeri appeared three decades later. It is not surprising that the work of this creative genius would have been noticed in Cremona, clearly inspiring the instruments of Stradivari in the 1690s and most certainly later, Guarneri del Gesu. Maggini never dated his labels. Consequently, it’s impossible to trace his development as a maker let alone accurately date his instruments. Dendrochronology studies of the spruce from many instruments show that he often used extremely old wood. 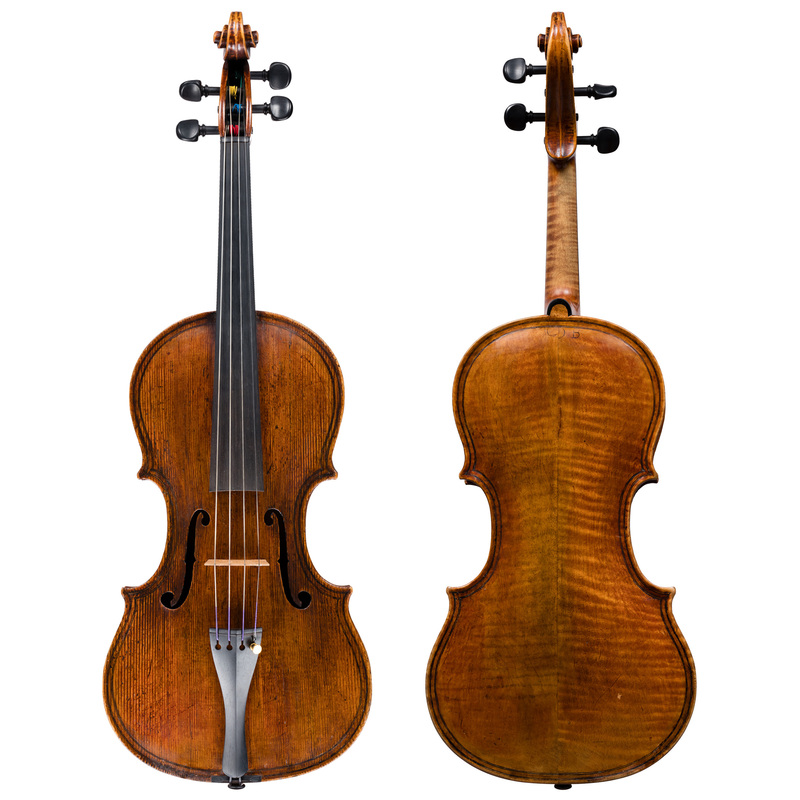 As with so many Brescian instruments, this viola has been reduced in size. It was sold by W. E. Hill & Sons in 1931 and illustrated in the first volume of “The History of the Viola” by Maurice Riley.